The vast variety and rapid evolution of mobile devices makes it virtually impossible to create customized online content that is completely viewable on every type of mobile device. As a result, the concept of responsive design has arisen, which essentially optimizes the look of Web content and creative for any mobile screen. This technological solution is divided into responsive Web design (RWD), which tailors the appearance of a Web page’s layout and content for maximum view ability, and responsive creative design (RCD), which performs a similar transformation for the creative content of advertising. 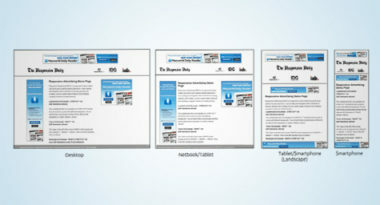 Clickz.com reported on how responsive design has responded to the mobile needs of both consumers and companies. The purpose of responsive design is twofold. The first is to provide an optimal mobile viewing experience for the rapidly growing market of mobile device users. The second is to enhance the reach, clarity, and overall effectiveness of online content and creative for companies’ mobile marketing strategies. The technology works by analyzing the assets of each Web page according to the elements that can be modified or moved based on the specific mobile device’s available screen space. Then, the content is re-configured to fit and function optimally for each mobile screen. 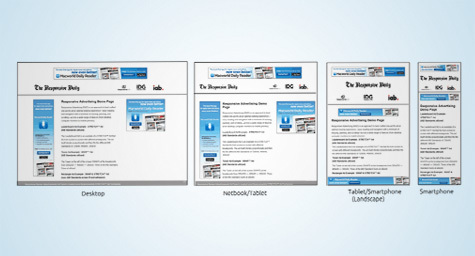 For example, a wide skyscraper ad on a larger screen could be resized and repositioned to make it more viewable on a smaller device. Beyond the immediate benefits of optimizing the mobile viewing experience, responsive design also has a direct effect on business systems and strategies. Companies may find that the use of responsive design has an impact on the sale, metrics, and performance of individual mobile ads. Marketers may discover that the monitoring and measuring of multiple ad layouts requires different resources to truly track performance. While responsive design can improve the look, legibility, and loading time of online content, the creation and success of compelling content is still the responsibility of the people producing the campaign. It may take additional effort to ensure that every ad format is developed, designed, and deployed correctly, yet this hard work is likely to be rewarded with better campaign performance. Ironically, the ongoing issue about the standardization of ad sizes may become obsolete with the adoption of responsive design. Still, industry concerns over standardizing sizes may be shifted to the creation of accurate ad metrics, public policy, and business operations related to this customized mobile content. For now, responsive design is offering a viable virtual solution to optimal mobile viewing. It’s a promising development that may further speed the major momentum driving mobile advertising today. At MDG Advertising, a full-service Florida marketing firm with offices in Boca Raton and New York, NY, our 360° marketing approach uses just the right mix of traditional and online media to reach your marketing goals. While some industries may fare better in print and others online, we strive to create a balanced approach where digital and traditional marketing efforts support each other and your marketing message is tailored to the medium. To stay on top of the latest trends in mobile marketing, including responsive design, contact MDG Advertising.